Democratic candidates Jay Gonzalez (left) and Bob Massie got pumped up before their debate at UMass Boston. Jay Gonzalez and Bob Massie both argue that experience is important when picking a governor. In a primary fight largely devoid of differences, what kind of experience they offer may be the clearest one. Jostling in their most high-profile debate since their primary field was whittled to two, the Democrats on Thursday coupled their demands for a bolder vision — and more revenue — with disparate pitches. Gonzalez portrayed himself as a progressive budget expert armed with insight into how Beacon Hill works. Massie called himself as a world-traveled change agent who’s equipped with the skills to motivate others. In a 50-minute forum, however, it took about 45 minutes to get there. Gonzalez and Massie spent most of Thursday’s debate, sponsored by The Boston Globe, WBUR, and the McCormack Graduate School at the University of Massachusetts Boston, targeting an opponent who was not on stage at the Dorchester school’s campus. Republican Governor Charlie Baker, they argued, has not done enough to address the opioid addiction crisis, the Massachusetts Bay Transportation Authority, or affordable housing. The state shouldn’t try to lure Amazon’s second headquarters here, Massie said. If he were governor, Gonzalez proclaimed, he would fire Keolis, the company that operates commuter rail for the MBTA. Any slivers of daylight between the two self-styled progressive Democrats were largely contained to what details they emphasized from their similar policy platforms — or what unflattering adjectives they used to describe Baker. But pressed to lay out exactly the differences voters can weigh in the Sept. 4 primary, a different picture began to emerge. Gonzalez, a budget chief under former governor Deval Patrick, described the Massachusetts State House as a political world unlike any other, where the key to delivering on change starts with knowing the building. Massie, the environmental activist who ran for lieutenant governor in 1994 and has made climate change a tenet of his varied career, said he’s “good at inspiring,” a skill, he argues, that can translate to a state government he acknowledges he’s never worked in. 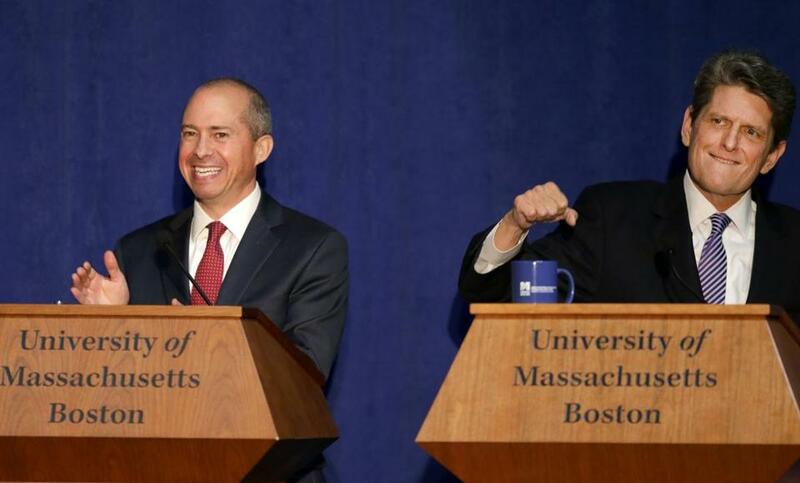 The back-and-forth, contained to the debate’s closing moments, represented one of the few times the candidates have let their gloves slip since a third challenger, former Newton mayor Setti Warren, exited from the race last month. Baker has said he does not plan to actively campaign until August and, to date, has not offered a full-throated pitch to voters. In a speech at the state Republican Party’s convention last month, Baker leaned heavily into the differences between him and his Democratic opponents, emphasizing his support for slicing the sales tax, his promise not to raise taxes, and his opposition to allowing medical marijuana to be covered by health insurance. Gonzalez or Massie offered rebuttals to each of those points Thursday and several times pointed to ways to generate more tax revenue. Both support a ballot question that would add a 4 percentage point surtax on household incomes greater than $1 million. In comparing himself to Gonzalez, however, Massie leaned heavily on the very ties Gonzalez emphasizes. Gonzalez offered an assessment of his former boss’s weaknesses over two terms, saying Patrick’s lack of experience on Beacon Hill when he took office hurt him in some ways. “We didn’t work as effectively as we could have with the Legislature,” said Gonzalez, who worked under Patrick from 2007 to 2013 and said he was often asked to run “point” when dealing with lawmakers on key issues. Gonzalez left weeks before Patrick unveiled a controversial tax package in 2013. “The tax reform . . . landed with a thud. And it landed with a thud because we sat in a room by ourselves developing that very complicated piece of legislation without input from the Legislature, without input from other key stakeholders,” he said. “And it was dead on arrival.” It’s a lesson, he said, he would take back to the State House if elected.